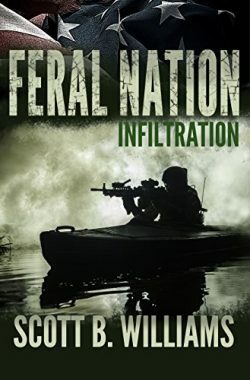 Infiltration is the first book in my new Feral Nation Series. If you've read any of my previous post-apocalyptic work in The Pulse Series or The Darkness After Series, you will find that it has much in common with those stories, although it is a different scenario. This time, the crisis is not a naturally-occurring solar event that unleashes a devastating EMP, but rather a series of deliberate acts that spiral out of control leading to violence, anarchy and finally, all-out insurrection. Anyone paying attention to the news headlines in the U.S. and Europe can see that the tipping point to such upheaval looms closer every year. 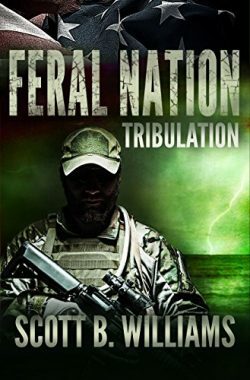 Feral Nation explores a not-too-distant future where widespread fighting has torn a nation apart, forcing survivors to either take sides or fend for themselves. In south Florida, where the action in Book One takes place, the situation is complicated further after a devastating hurricane completes the job of shutting down the power grid and cutting off survivors from any hope of outside help. Scott B. Williams has been writing about his adventures for more than twenty-five years. His published work includes nineteen books, both fiction and nonfiction. His interest in sea kayaking and sailing small boats to remote places led him to pursue the wilderness survival skills that he has written about in his popular survival books. His nonfiction travel narratives include On Island Time: Kayaking the Caribbean, a first-person account of his two-year solo kayaking journey through the islands. With the release of his first novel: The Pulse, in 2012, Scott began writing fiction and has since written multiple sequels in the ongoing Pulse Series and Darkness After Series. 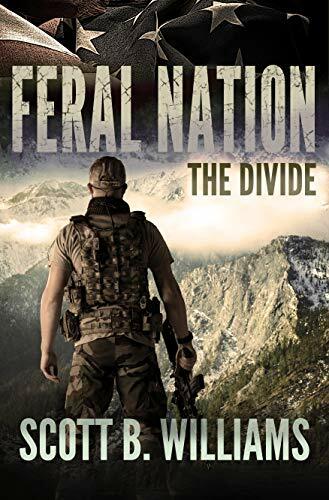 Professional security contractor, Eric Branson has been away fighting ongoing insurgencies in Europe when he realizes his own country faces the same fate. But before he can make his way back home to Florida, a catastrophic hurricane deals the final blow to an infrastructure ravaged by riots and terror, leaving survivors cut off and on their own. Amid the death and destruction in the aftermath, Eric begins his most dangerous mission yet, searching for the family he left behind. After returning from Europe to a post-apocalyptic south Florida ravaged by a killer hurricane and widespread violence, private security contractor Eric Branson learns that the daughter he came to save is still two thousand miles away. With a crew that includes his father and his ex-wife, as well as the young survivor that tried to rob him upon arrival, Eric embarks on a voyage across the Gulf to make his way into the heart of a nation ripped apart by anarchy and terror. Eric Branson and his crew have escaped a hopeless situation in south Florida, and crossed the Gulf of Mexico to reach the jurisdiction of Eric's brother, Deputy Sheriff Keith Branson. But they arrive to find devastation and violence as bad as what they left behind. The sheriff's department Keith works for has been decimated by riots and terror attacks. Law and order has broken down and the infrastructure nationwide has been severely crippled, leaving the desperate struggling to survive by any means necessary. For Eric, reaching Louisiana is just another step in a difficult quest that will take him overland to the Colorado Rockies in search of his daughter. Getting there will take everything he's learned in a decade and a half of fighting wars all over the world. Just like in the old days, things change and go downhill fast when the action begins, and the mission he's agreed to will test even a war-hardened SEAL and private contractor. Is it too late to save Megan from the danger she's gotten herself into? Eric won't know until he finds her, somewhere in the vast mountain wilderness into which she has fled. 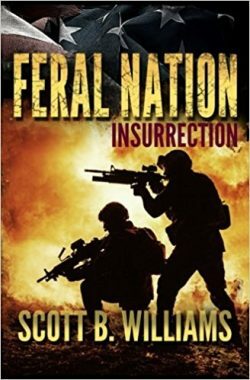 Feral Nation - The Divide is the forth book in the latest post-apocalyptic thriller series from Scott B. Williams.